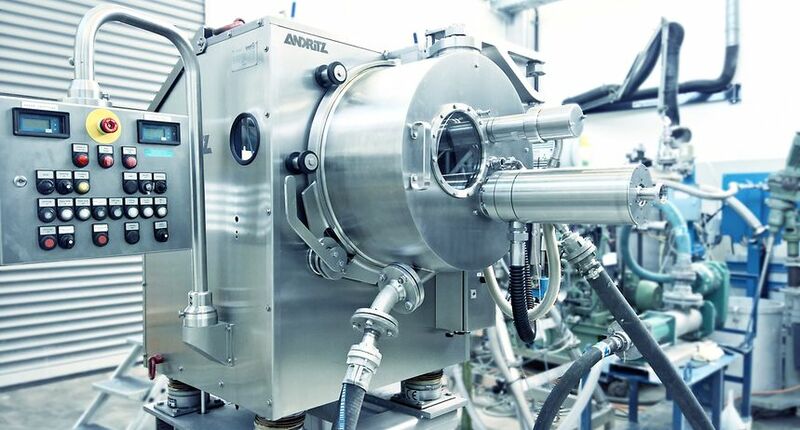 International technology group ANDRITZ will be presenting its wide range of proven separation technologies and services for powder and bulk solids as well as innovative automation solutions at the POWTECH fair in Nuremberg from April 9 to 11, hall 3, booth 313. At POWTECH, ANDRITZ will be presenting its patented, pneumatic discharge system for Krauss-Maffei peeler centrifuges, innovatively eliminating the need for gravity discharge. Krauss-Maffei peeler centrifuges are batch-operated filtration centrifuges that are known for reliable performance at high capacities. With the pneumatic discharge solution, a peeled product is immediately transported out of the centrifuge, removing product particles and dust right away. This results in increased yield with maximum filtration performance, a vast decrease in product losses, and minimal maintenance. The ANDRITZ booth at POWTECH will also give visitors the opportunity to explore a full-size PUREVO pharma peeler centrifuge fitted with this new pneumatic discharge system and learn about its benefits when applied in bulk chemicals, fine chemicals, and many other applications. ANDRITZ will also showcase its proven Metris addIQ control system, which is part of the ANDRITZ digital solutions offered under the Metris technology brand and enables customers to analyze and optimize industrial production processes. The results are enhanced availability and minimization of production costs while at the same time achieving increased overall equipment efficiency and reducing the risk of operational errors – not only for new production lines but also for operations that are already up and running. Interested visitors will also have the opportunity to hear about Industry 4.0 solutions for food production as well as the intelligent filter press in a presentation by an ANDRITZ specialist at the expert forum. Furthermore, process experts from ANDRITZ will provide deep insights into the comprehensive service portfolio, ranging from initial consulting to service agreements and process optimization to training programs. Visitors will not only be able to learn about service offerings like spare parts, rentals, local service, repairs, upgrades, or modernization of equipment and systems, but also about new features for the products displayed at POWTECH, like the SmartFIX filter cloth fastening system for filter centrifuges or the intelligent filter cloth. Further product presentations include two proven solutions for powder and bulk solids applications – the ANDRITZ Gouda paddle dryer and the ANDRITZ fluid bed dryer. The paddle dryer is a well-known, proven solution for versatile thermal processing and can be tailored to meet the customers’ specific requirements. For food and chemical applications for example, ANDRITZ offers accurate residence time control as well as fluid bed drying/cooling and granulation systems as fully customized process solutions suitable for any bulk materials used in the chemical, minerals, and food industries. The fluid bed dryer operates in open systems as well as in closed, inert gas loops to keep the dried granules in evenly floating motion (fluid bed). Besides standard setups for such high-capacity applications as soda, polymer, and fertilizer drying for example, the technology range is also suitable for sophisticated applications requiring highest safety or efficiency standards with maximum operating reliability. ANDRITZ fluid bed systems are able to handle inflammable, combustible, and dust-explosive products as well as materials with critical flowability, high moisture content, or even liquid feed materials. A passion for innovative technology, absolute customer focus, partnership, reliability, and integrity are core values to which ANDRITZ is committed. The listed Group is headquartered in Graz, Austria. With almost 170 years of experience, 29,000 employees, and more than 280 locations in over 40 countries worldwide, ANDRITZ is a reliable and competent partner and helps its customers to achieve their corporate and sustainability goals. ANDRITZ Separation is one of the leading separation technology specialists with the broadest technology portfolio in solid/liquid separation. The industries served include sectors ranging from environment to food, chemicals, and mining and minerals. The comprehensive product portfolio for solid/liquid separation comprises mechanical technologies such as centrifuges, filters, screens, thickeners, or separators, and thermal technologies such as dryers or coolers. The service sector focuses on customer support through local presence, prompt delivery of spare and wear parts, process monitoring and optimization, as well as operator training. In addition, the Separation business area offers technologies and services for the production of animal feed and biomass pellets.